With the ever growing popularity for tattoos comes the need for tattoo removal. The market today, is flooded with numerous procedures for tattoo removal. One such procedure which is widely used by many people is the laser procedure for tattoo removal. This particular tattoo removal treatment has proved itself to be the gold standard for tattoo removal and has significantly replaced many other procedures. Laser technology for tattoo removal functions by targeting the tattoo with the use of highly concentrated light rays, which penetrate the surface of the skin in order to eradicate the tattoo. Presently, there are 3 different types of laser which are utilized for tattoo removal. Which laser needs to be put to use will actually depend on factors like the color of tattoo ink and also the patients skin tone. The effectiveness of the laser procedure for tattoo removal also depends upon factors such as, pigments used as well as the capacity of the patient’s immune system, to absorb and then rid itself of the destroyed fragments of ink. 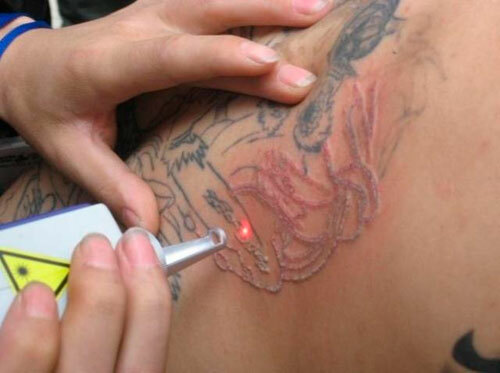 1 – The first type of laser for tattoo removal is the Q-switched Ruby. This particular laser functions more effectively on green and sky blue colored tattoos. The Q-switched Ruby is not easy to use on dark skin. 2 – The next type of laser is the Q-switched Alexandrate. This laser is utilized for removing green, black and blue colored tattoo ink. 3 – The last and more advanced laser for tattoo removal is the Q-switched ND YAG. This particular laser is more advanced than the other 2 lasers and helps in removing blue, red and black color ink. Due to the fact that this laser does not absorb melatonin from the skin, it is best suited for people who have a darker skin tone. There are various types of lasers utilized in different aesthetic procedures as well as for tattoo removal. These lasers vary in pulse duration, wavelength and energy levels. Some types of lasers are capable of providing varied wavelengths and spot size. It is very important to have varied pulse durations as well as wavelengths. The different colored tattoo inks absorb light far better at a certain wavelength and the lasers which use shorter pulses tend to be a lot safer as well as effective. How does the laser treatment for tattoo removal work? Laser treatment for tattoo removal targets the tattoo area by making use of pulses of laser energy at a precise wavelength. The ink in the tattoo is broken into small sized fragments, which can be removed from the body by the immune system. Normally, it requires anywhere between five to fifteen treatment sessions before a tattoo completely fades out. The number of treatment sessions required for this will depend upon the location of the tattoo, color of ink used and the size of the tattoo. Treatment sessions should be spread across 6 to 8 weeks since this is the actual time which is needed for the body to completely eradicate the ink fragments. Each tattoo removal session is around 10 to 30 minutes. Following the procedure an antibiotic cream as well as a sterile dressing would be placed over the tattoo. A newly done tattoo is not easy to get rid of in comparison to an older tattoo. An older tattoo holds a lesser amount of ink as compared to a new one. Tattoos made using red, white or skin colored ink are also difficult to eradicate. Such colors could possibly turn black following the laser treatment. A turquoise colored tattoo is considered to be extremely difficult to get rid of, especially since there are no lasers available that are able to effectively break down turquoise colored ink. Does laser removal cause any discomfort? Laser tattoo removal can cause a certain amount of discomfort. Many people who have used the treatment describe the feeling to be similar to getting pricked by a needle and even getting snapped by a rubber band. This feeling of discomfort is due to the pulses from the laser. Normally, it requires around 10 to 30 pulses in a single treatment. To reduce the pain or discomfort, use ice along with some local anesthetic cream on the tattoo area. Patients can also take Tylenol some hours prior to the procedure. Avoid the use of medications like aspirin since they could lead to skin discoloration. In an exceptional case the surgeon might even inject a local anesthetic into the tattoo before beginning the laser treatment. It is always better to speak to a surgeon before the procedure so that, you are aware of the procedure and side effects if any. After the laser treatment for tattoo removal, you will experience redness on the skin and feel similar to sunburn. There is also a possibility of bruising following the treatment. The sunburn sensation usually disappears after a few hours. However, it is important to ensure that the treated area doesn’t get wet. A laser tattoo removal procedure is quite costly. The cost per session would depend upon the size of your tattoo and the color of ink. Normally it requires 3 to 10 sessions. The number of sessions required would depend upon the shade and composition of the ink, the depth of the tattoo, and your skin tone. Thus, the total cost might vary from a couple of hundreds for a small superficial tattoo to thousands for a large colorful tattoo. Laser treatment does have a few side-effects. Mentioned below are some side effects of laser treatment for tattoo removal. 5. An allergic reaction due to the ink released from the tattoo.